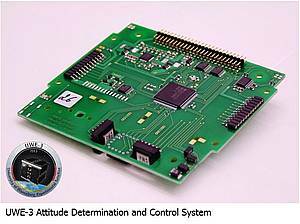 The main mission objectives of UWE-3 are to demonstrate the use of a real-time miniature attitude determination and control system on-board the satellite, using a variety of sensors, magnetic torques and one reaction wheel. To establish a robust base for a series of future satellites, UWE-3 additionally features an advanced modular and flexible architecture of the pico-satellite bus, in order to increase robustness, reduce mass and add reliability to the overall system. One example is the redundant On-Board Data Handling core module of UWE-3, which is tolerant to SEU’s, capable of repairing its own memory and therefore able to recover the satellite and ensure safe operations. The system design supports rapid development, integration and testing of the satellite, as well as maintenance, extension and simple replacement of subsystems after integration. Moreover its standardized interfaces allow efficient manufacturing and support reusability of components. The UWE-3 project is supported by the German national space agency DLR (Raumfahrt-Agentur des Deutschen Zentrums für Luft- und Raumfahrt e.V.) by funding from the Federal Ministry of Economics and Technology by approval from German Parliament with reference 50 RU 0901. In the beginning of February 2015 we uploaded new software images for all UWE-3 subsystems to the satellite, which comprise in total 3 images on 9 micro-controllers. This software was installed thereafter and is since then successfully operational on UWE-3. The software update targeted major improvements for the attitude control of the satellite, which was the focus of tests right after the update. The satellite now is back to a preliminary un-operated state (switching between the on-board computers every 4 days) while we process the data and decide on future operation plans. Thanks a lot for your great support! Especially we want to thank: CX8AF, DK3WN, EU1XX, G7GQW, IW0HLG, JA0CAW, JA1GDE, JA5BLZ, JA6PL, JE1CVL, JE9PEL, JO1PTD, LU4EOU, ON4HF, PE0SAT, R4UAB, Rainer Rothe, SP7THR, VK5HI. UWE-3 was successfully launched with a Dnepr Launch Vehicle from Yasny Launch Base on Nov. 21 07:11 UTC. Already on 08:46 UTC during its first low elevation pass over Würzbug first life signs of UWE-3 could be received. Early telemetry data indicated that UWE-3 housekeeping is performing excellent. Also various radio amateur around the world could record UWE-3 telemetry beacons. Many thanks to PE0SAT and DK3WN for sending us first telemetry frames of UWE-3!